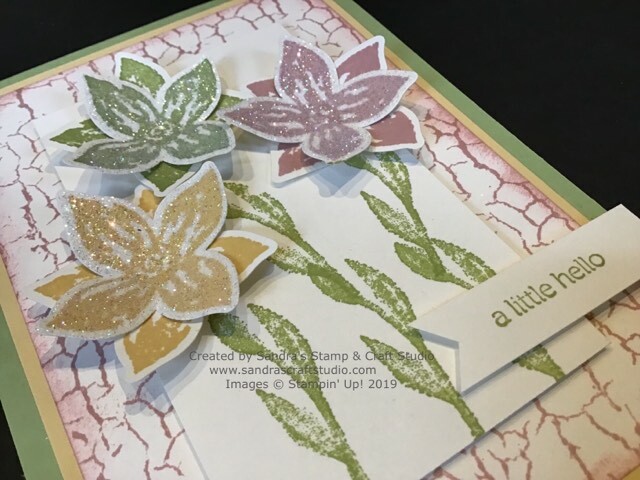 Todays ‘Blog Hop’ we are all showcasing projects using the gorgeous ‘Spring’ like Stampin’ Up! cardstock colours Pear Pizzazz, So Saffron and Blushing Bride, pictured in the graphic in the header above. Today I am sharing a technique I shared with attendees of my recent Totally Techniques Creative Retreat Weekends. 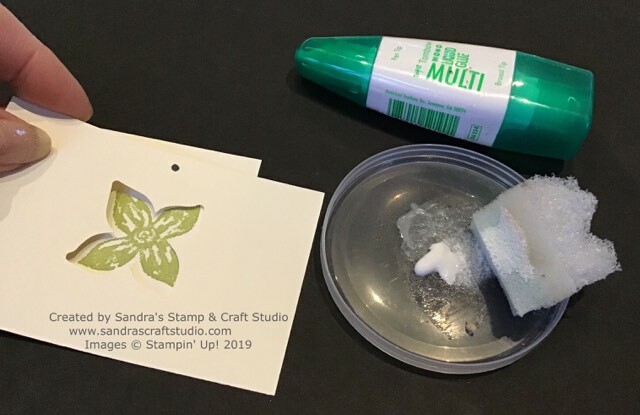 I’ve seen this technique referred to as ‘stamping with glue’ but I am rather precious of my stamps and didn’t fancy getting PVA glue lodged in the fine details on my stamps. 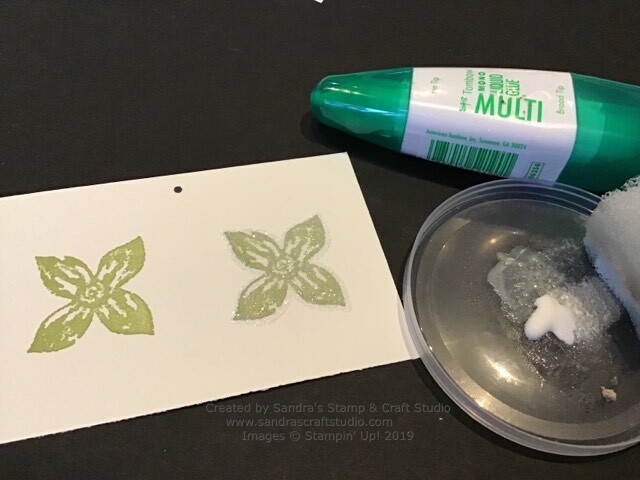 I found this works best using a stamp that has a coordinating punch or die. 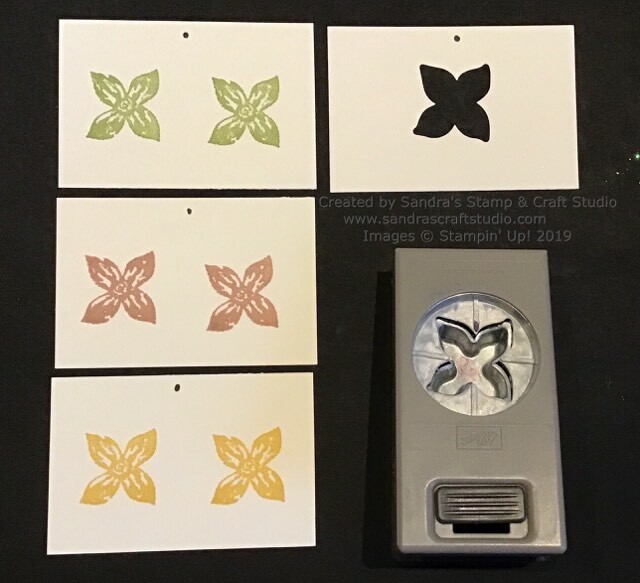 My images were stamped twice in each ink colour, Pear Pizzazz, Blushing Bride and So Saffron, on a scrap of Very Vanilla card. Punch or die-cut shape from another scrap of card to create a mask template. Next squeeze some Tombow Multipurpose Adhesive onto a Silicone Craft Sheet (oops….mine was elsewhere so I used a plastic lid). Place your mask over stamped image and gently dab glue over image with a sponge. Remove your mask and, whilst Tombow is still wet, pour over Dazzling Diamonds Stampin’ Glitter, tapping off excess back into tub, and allow to dry. You can also heat briefly with a Heat Tool, to speed up the process. Gently brush off any excess glitter with a soft brush and you will get minimal shedding from your project. To build my card, I cut a Pear Pizzazz card base with a So Saffron layer and Very Vanilla top layer which had been stamped in Blushing Bride using the Crackle Paint background stamp. Edges were sponged using Blushing Bride ink pad. 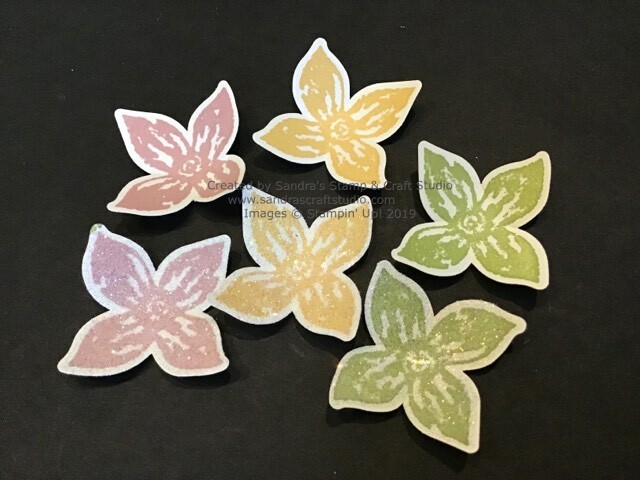 A smaller Very Vanilla was stamped in Pear Pizzazz ink to add some stems. Flowers were then assembled with the plain petal at the back and glitter petal off-set on the front. I then shaped these in the palm of my hand, before attached above the stems. 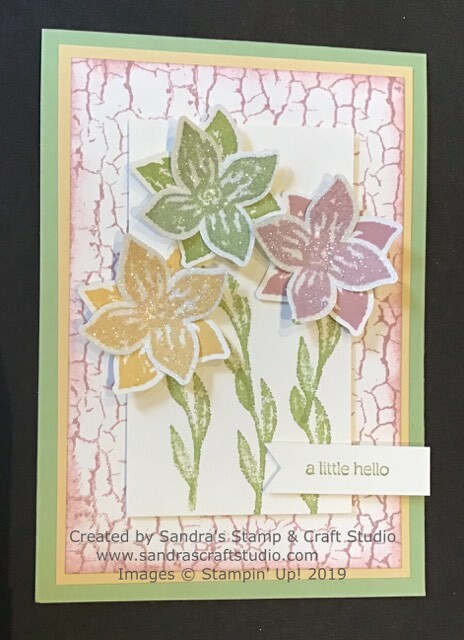 I hope you like the finished card and enjoyed my Colour Combo card this month and step by step Tutorial. 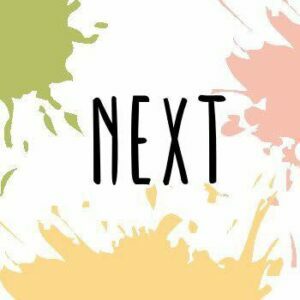 Please leave me a quick comment before hopping to Angelique’s Blog to see the lovely project she has created to share with you today. Thanks for stopping by and hope to see you back here soon. 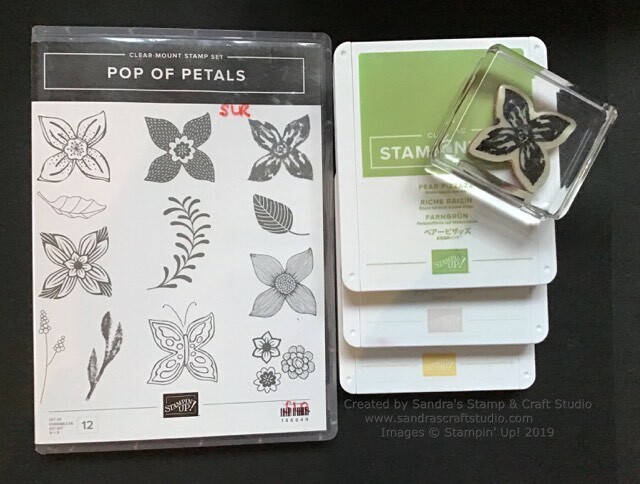 If you are in the UK and do not have a Stampin’ Up! Demonstrator, I would love to help you get started ordering your favourite supplies. Whether you are shopping as a Customer, wish to Host your own Workshop / Party, or are interested in joining my Team to buy your own craft supplies at a discount or as a small business, give me a call and we can catch up, or visit my 24/7 online shop following the link below. to quote the monthly Hostess Code at the top of this screen or in my signature block below. Posted in Technique, Uncategorized and tagged Blushing Bride, Colour Combo Blog Hop, Crackle Paint, Four-Petal punch, Pear Pizzazz, Pop of Petals, So Saffron, Stampin' Up!. You have designed a very nice card. I like it very much. Greetings from Leipzig / Germany. Nice Card! Thanks for sharing. I love the Crackle Paint background – I need to use these flowers!